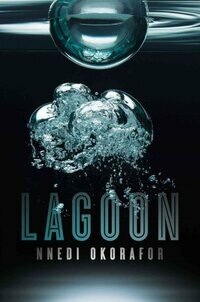 Lagoon absolutely teems with characters, perspectives, and Englishes. Everything about it is diverse and varied: In structure it feels part oral tradition, part theater, part screenplay, part memoir; in content it bubbles over with characters from different species, ethnicities, classes, genders, sexualities, religions. If ever a book set out to mirror the vibrant, brimming city for which it was almost titled, Lagoon has certainly done it. But, consequently — and perhaps appropriately — it’s as choppy a read as the ocean on a stormy day. I was given the UK edition last year (by a kind stranger who has yet to take credit for it! Thank you kind stranger! ), and the cover is utterly different, and I’m thinking about the ways covers might change our experience of reading a book even when we know what to expect. I’m still trying to figure the dynamics of it out. Briefly, the UK cover gives a much better sense of the book’s contents — the quality of teeming, the diversity, the centering of a woman, the transformation, the rising of water to meet city and all the denizens therein. It’s messy and vibrant, the words themselves shaped in negative space by the bodies of the sea creatures. The US cover looks tilted to appeal to a non-genre market; it’s glossy, a beautiful photograph of air moving through water (that looks slightly like a brain? 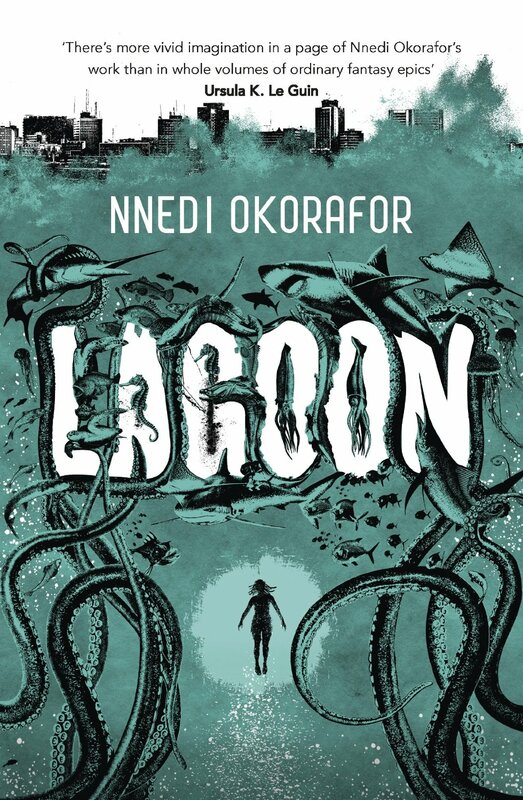 ), and one can read thematic significance into that after the fact — but it’s so sleek and clean, it says “oceans = space” and “aliens” to me much more than “Lagos,” ultimately, and it’s an interesting shift in emphasis. Covers, man. How do they work! This entry was posted in Uncategorized and tagged nnedi okorafor, npr, reading, review, reviewing. Bookmark the permalink.